This afternoon I returned to the War Memorial Opera house for the fifth of the eight performances of Giuseppe Verdi’s Rigoletto as part of the annual Summer Season of the San Francisco Opera. Regular readers probably know by now that my wife and I continue to renew our subscription seats; and I particularly enjoy them for the excellent view of the orchestra pit, as well as the stage. The result was that I had a far richer impression of Music Director Nicola Luisotti’s contribution to this powerful production, which was just as compelling this afternoon as when I saw the second performance a little less than two weeks ago. However, before going into specifics of how much Luisotti added to this production, it is important to note that, whatever one may think about Verdi’s capacity for summoning “grand” sounds, he can achieve some impressively intimate effects by complementing solo voices with only a few instruments. Thus, when bass Andrea Silvestrelli is singing Sparafucile’s first encounter with baritone Quinn Kelsey’s Rigoletto, his description of his “work practices” as an assassin is accompanied by a single cello (David Kadarauch) and a single double bass (Joseph Lescher) playing in parallel octaves. The effect is, to say the least, spooky enough for the attentive viewer to be suspicious whenever Sparafucile comes into view. The violin solo, which is much more familiar due to the many concert performances this aria receives, was given just the right rhetorical twists when played by Concertmaster Kay Stern. What is particularly striking about the opera as a whole is just how compact everything is as the dark narrative gradually unfolds. That darkness is often reinforced through subtle gestures, and it was particularly interesting to observe how Luisotti’s management of tempo in the pit showed so much sensitivity to those gestures. The conductor, after all, is the necessary conduit between what happens on stage and what happens in the pit; and awareness of the stage tends to take higher priority, because the Concertmaster can see to many of the “management” activities in the pit. Of course the best operas are the ones in which the details in the music matter just as much as the dramatic unfolding of the details in the libretto. However, even when both sets of details are taken into account by all of the performers, the mutual reinforcement of music and drama still tends to be a rare delight. 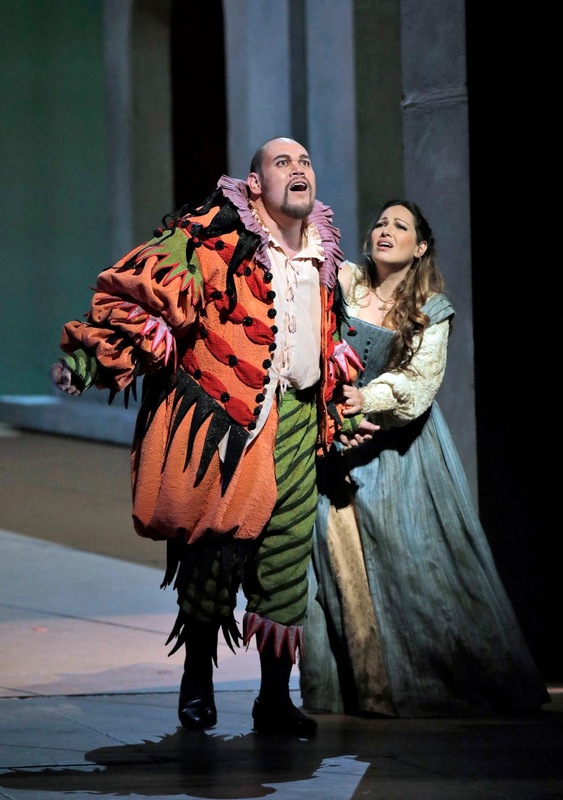 Luisotti clearly knows how to prioritize that reinforcement, and his technique as a conductor does much to establish this particular production of Rigoletto firmly in the memory of those fortunate enough to experience it.